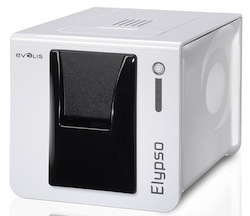 Evolis released Elypso, a desktop card printer that offers features for instant issuance in one model: manual card feeding, front-desk operations, dual-sided printing and encoding for magnetic stripe, contact and contactless chip card. Elypso comes with the latest software from Evolis. This printer is monitored from the user’s interface and through pop-up alerts on the printing status. Cards can be loaded at the printer’s front end, while the printing ribbon, available in a cassette format, can be dropped into its slot in the printer. Elypso can deliver a personalized card in color 20 seconds. This card printer can meet any requirement in encoding, from magnetic stripes to contact or contactless smart cards. Encoding features can be combined in the same printer, as encoder upgrades are carried out. By linking these add-on encoding modules to the internal USB hub, any qualified person can integrate an encoder, on-site, without having to ship the printer to an Evolis center for the upgrade.